Facts about Potoroos. "Scientific name for Potoroos is Potorous". The Potoroos, also called the Rufous Bettong, Rufous rat kangaroo and woylie, is part of Potoroidae family. 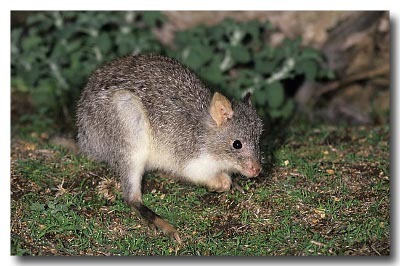 Of this family of species, three are potoroos, four are bettongs and one is the rufous rat-kangaroo or Potoroos Rufous. Potoroos Rufous are a species of very small kangaroos; they have no relation to the rat. They are marsupials. The Potoroos is around a foot (30.4 cm) long, with a tail as long as the body. The Potoroos have silver gray to light brown fur. Their muzzles are furred, but their tails are almost naked. The Potoroos lives in open forest. They build nests out of grass under any type of shelter. Potoroos are herbivores. They eat grass, flowers, seeds, roots and even fungi. Their preferred foods are tubers, bulbs and roots. The Potoroos especially like truffles, and they spread the spores of the truffles through their waste. Female Potoroos give birth to one offspring at a time. It lives in the pouch for about a month before leaving. Potoroos stays with the mother for another eight months or so. The females do not have a set breeding period. Aside from mating season and when the young are following the mother, they are a solitary species. The Potoroos is nocturnal. However, they do not have very large eyes like the Kultarrs. Potoroos Rufous numbers have declined due to predation by cats and foxes. They may or may not be in decline due to degradation of their habitat since the introduction of the rabbit. However, there is no overlap between their diets and that of the rabbits. For example, during the winter, Potoroos primarily eat fungus, tubers, fruit and forbs while rabbits mostly eat grasses. According to a study by Alan Robley, their ability to vary their diet means that they are better able to survive droughts than rabbits. The Potoroos territory sometimes overlaps with that of the Norther Bettong, but they don’t compete due to their differing diets. The Potoroos range used to include most of North South Wales, Australia.